Taco Bell Doritos Locos Taco: Ole! If you are in any way a regular reader of this blog, you gotta know this was coming. 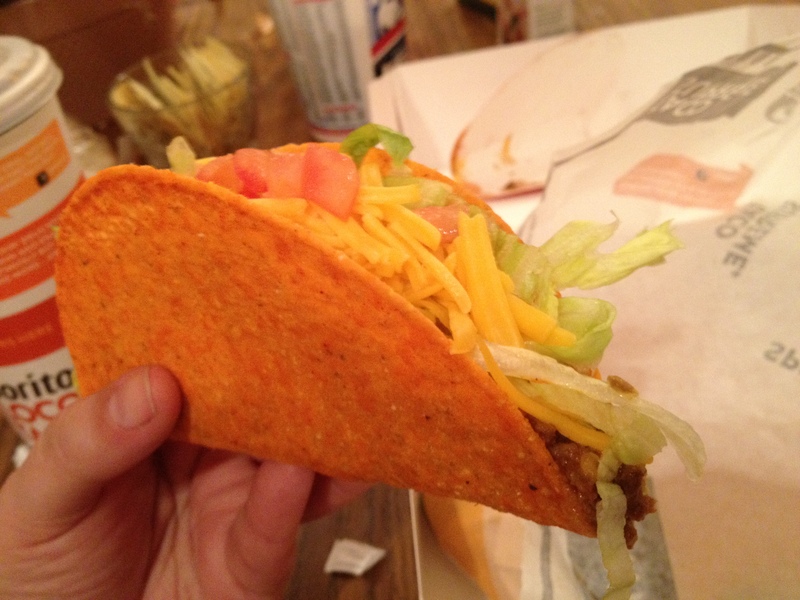 Taco Bell rolled this taco out a little while ago as a test and now it’s out nationwide. What is it? It’s the Doritos Locos Taco Supreme! 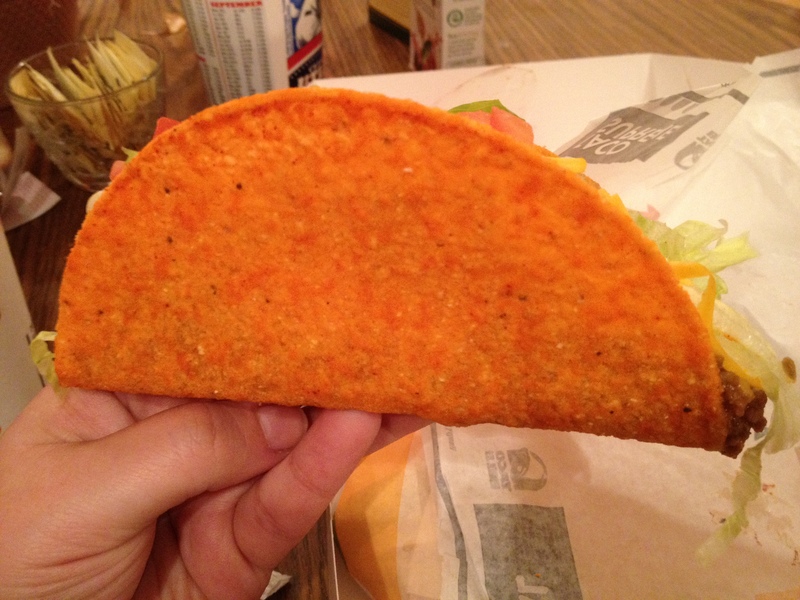 It’s a taco made with a shell that is a giant Dorito. If you are a fan of Doritos in any way, you’ll really enjoy this. It’s got the cheese, it’s got the crunch and it’s got the taco insides: seasoned beef, lettuce, tomato, cheese and reduced fat sour cream (the only difference between the Supreme and the regular is sour cream). It’s a really simple idea and, frankly, I am kind of surprised they hadn’t come up with it sooner. Doritos are basically just corn ships, and if Tostitos Scoops have taught us anything, it’s that corn chips can be molded to any shape. The only problem is that if you don’t eat the taco within a few minutes, the heat from the meat kind of makes it a little pliable, which is kind of weird. 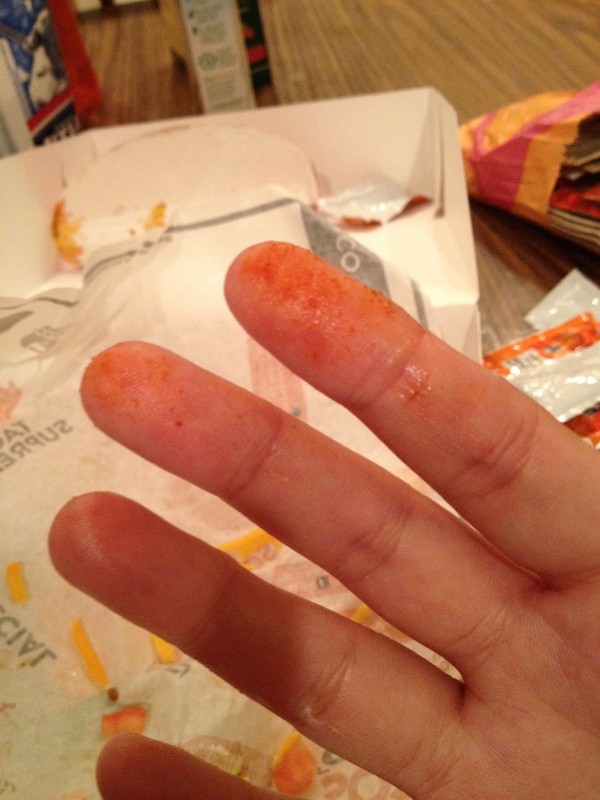 (Have you ever eaten a wet Dorito? Or one that’s been in dip? That’s what I mean.) So, if you get one, get to it! If you manage to get into it before the heat does, the shell will crumble a little bit, just like a regular taco shell. The final question people ask me is this: are your hands covered in cheese when you are done? Like after you eat a ton of Doritos (not that I would know anything about that…)? The answer is: just enough cheese ends up on your hands. If you end up with a fist-full of cheese, then you shouldn’t be cuddling with your Doritos Locos Taco. So is this taco worth a shot? Most definitely! It’s silly cheap too, so get to it. If you are super hungry, there is a $5 Doritos Locos Taco box that comes with the Doritos Locos Taco Supreme, a crunchy taco, a Burrito Supreme and a drink. With people either eating no fast food at all or eating it like it’s their job, fast food companies are left trying to do the same stuff for thier usual customers who are accustomed to the same things and also chasing customers who long for something fast but different. Wendy’s is no different. I have not really been a fan of breaded chicken sandwiches. It seemed like a lot of bread to me and not much anything else, so I stayed away. While I don’t each much fast food, I did kind of lean towards burgers and Wendy’s burgers were always on the top of my list. The franchise by me is pretty on it: clean, fast (for the most part, as opposed to the McDonald’s by me. You could kill a cow, cut it up, cook the meat, digest it and eat another meal as slow as their drive thru is, at any time of the day) and good at getting the food out hot. Lately, Wendy’s had been advertising their new burger, “The W” and it looked interesting. 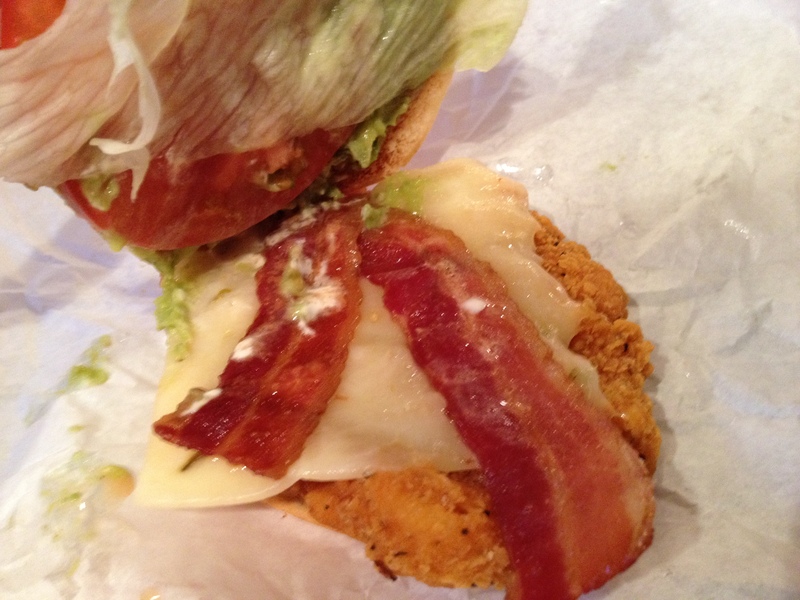 They also had been advertising the “Spicy Guacamole Chicken Club” Sandwich that, well, it had bacon and guac. I was sold. 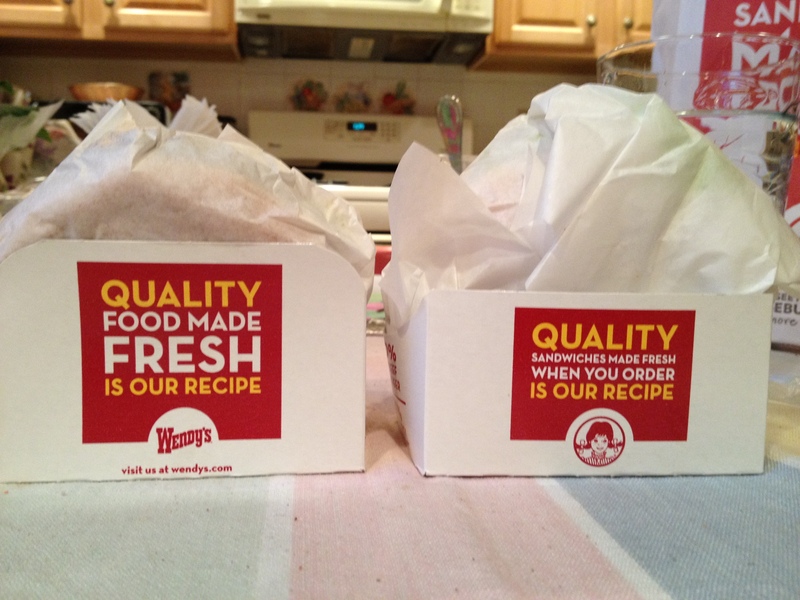 When I took the 2 sandwiches out of the bag, I noticed that the weren’t wrapped in Wendy’s usual foil lined paper, but in a parchment and then in a small box holder. I really like the small box holders and the only other place I have seen them is at Hardee’s/Carl’s Jr. 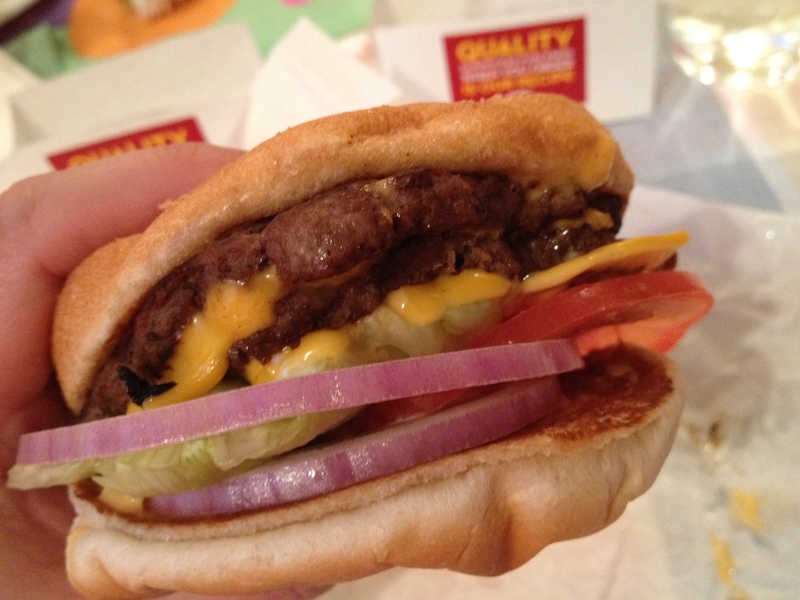 They keep the burgers in one spot so they don’t slide apart and keeps them from unraveling. Thumbs up for that! It shows that the Wendy’s people are paying attention. First up is the “W”. The “W” is Wendy’s attempt at a killer burger with a special sauce that isn’t 5 bucks. It’s $2.99! Any person who has half a brain is not expecting their fast food to look like it does in the ads. If you don’t know why this is, go and google “food styling”. This burger didn’t look like it did in the ads but it still looked ok, and most importantly, the burgers were still nice and warm by the time I got it home. 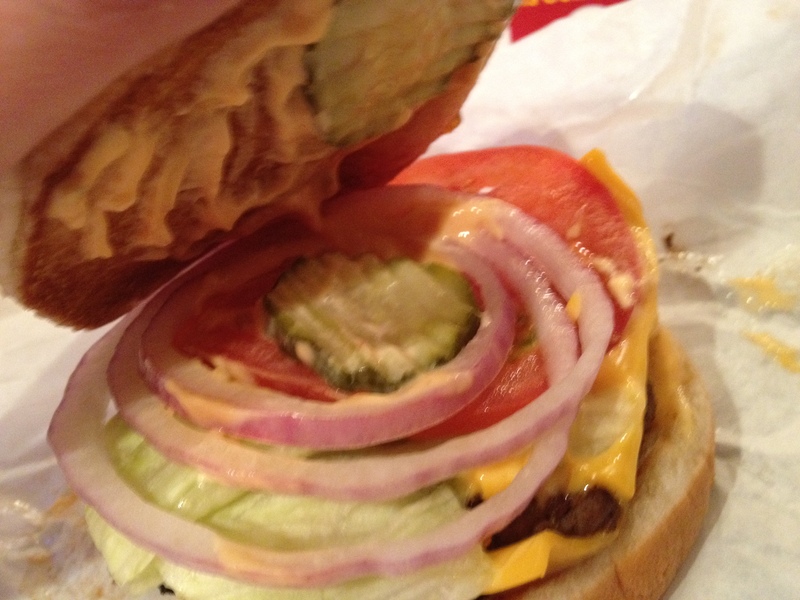 I’m not too into using the word “premium”, but this burger is supposed to have “premium” toppings. I guess this means they are cut bigger, and yeah, this burger has it. The pickles were thicker and crinkle cut (I imagine they did that so the sauce could get all up in the ridges), the red onion was thick cut, and the tomato, well, it was kinda thin. I don’t have too much of a problem with that, but if you were looking for a giant piece of tomato, well, you might be missing out. Altho, it could have been just a weirdly cut batch of tomatoes, who knows. The shining star of this burger is new secret sauce. It really is delicious. It’s sort of a thousand island but with red pepper in it too, to give it some texture, along with little bits of pickle. Combined with the burger patties and the rest of the stuff it really comes together. The food scientist guys over at Wendy’s really hit it on this. 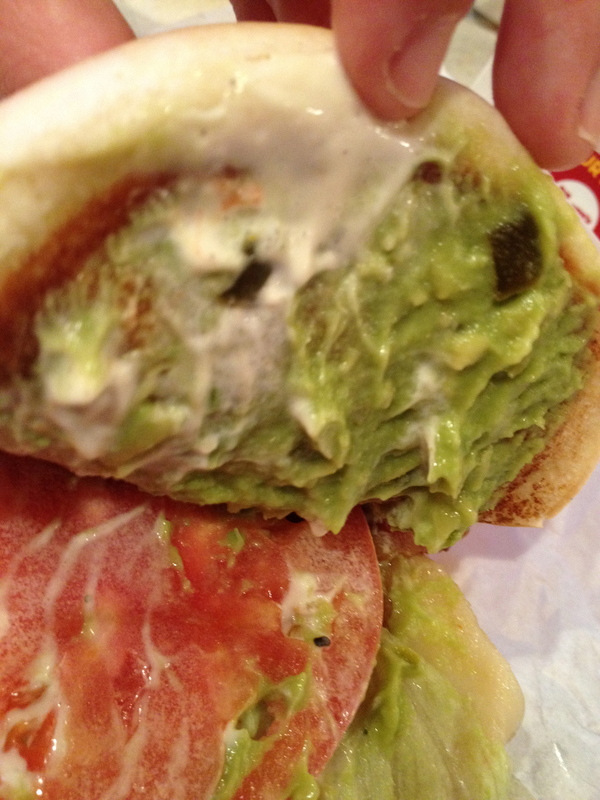 Next up is the Spicy Guacamole Chicken Sandwich. Like I said above, I am not usually into breaded chicken sandwiches. It’s too much bread and it ends up being a dry mess of a meal. So, when I pulled up into the drivethru and saw this thing on the menu, I had to try it. Let’s take a look inside the sandwich. First off, this thing comes with bacon. Yay! 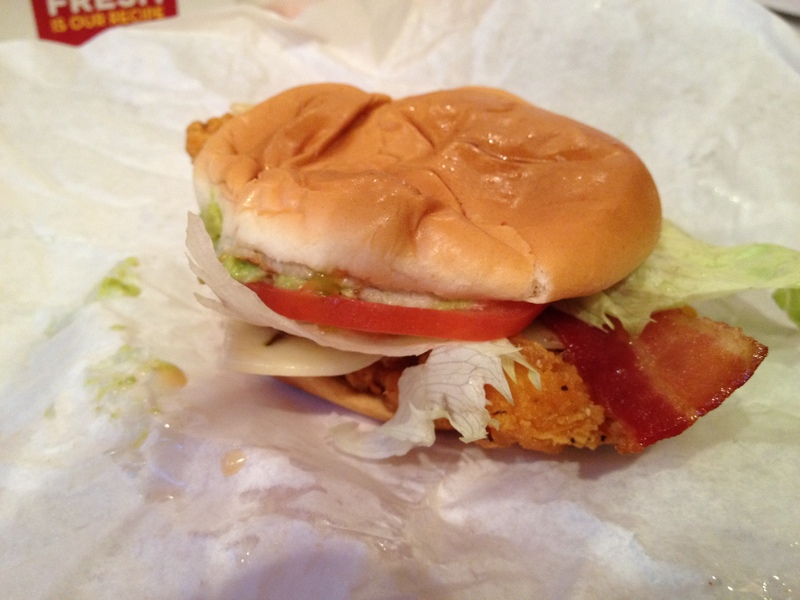 Sometimes when a burger comes with bacon, it’s barely there, or unrecognizable. Also, sometimes it’s just dripping with that liquid smoke flavor that makes it taste like crap. This bacon was actually recognizable and delicious. 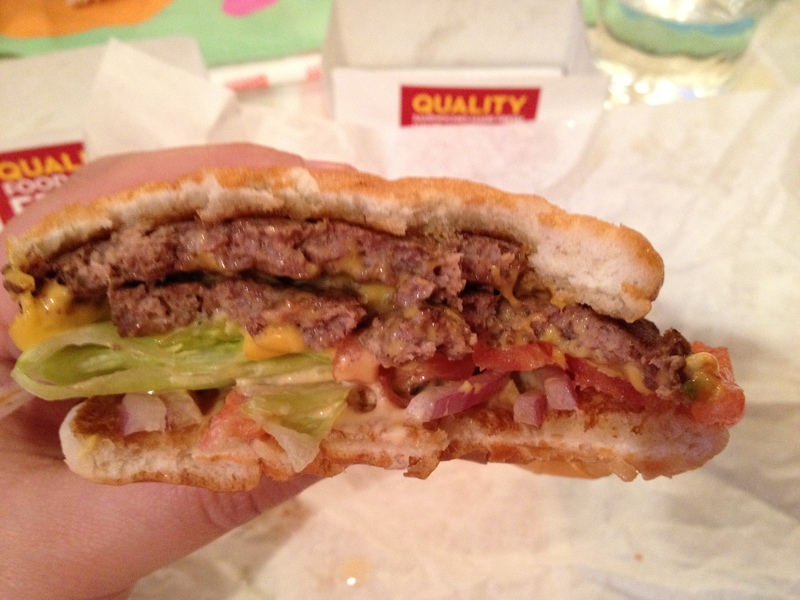 They give you just enough to make a difference in the burger but not too much that it is overpowering. The chicken patty had a little bit of a kick of spice to it, kind of peppery, and it’s topped with a nice pepper jack cheese. They could have stopped right there and call it a spicy chicken sandwich. Even the buttered buns, which by the way, both the sandwiches have, were a nice touch. And then they took a big step forward by adding the guacamole! The guac, of which they are not skimpy with, gives the sandwich another texture besides bread, chicken and bacon, and it also has some red pepper in there to give it even more depth of flavor. Again, I say, I am not really into chicken sandwiches but man, this thing is pretty kickass. I will definitely be ordering this again when I get back to Wendy’s. I really have to hand it to Wendy’s. The fast food landscape has become littered with all sorts of goofy new products with places trying to sell new things in order to rope in the public. Wendy’s seems to be doing the opposite, they are looking within to see what they are good at: burgers, chicken sandwiches and salads. They are taking these items and beefing them up, giving them new spins and overall boosting up their menu items without gouging you in the pocketbook. In the day and age where the economy stinks, Wendy’s gets it. My hat is off to them.